You've probably noticed a certain fundraising movement happening right now that involves individuals dumping buckets of ice water on themselves or making a donation for ALS research (or, preferably, both). It’s been pretty successful. But what if we told you about a way you could help fund Mayo Clinic Research and stay perfectly dry? All you'd have to do is take a five-question quiz. 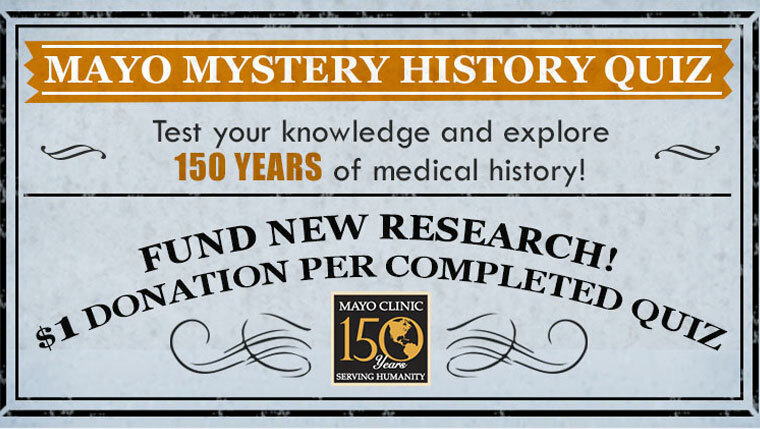 Our friends in Development are challenging folks to challenge ourselves by taking the Mayo Mystery History Quiz, in honor of Mayo's 150th anniversary. Regardless of how well you do, just taking the quiz benefits Mayo Clinic research, thanks to the generosity of a grateful Mayo patient. For every person who finishes this five-question challenge — no matter what your score — this benefactor has offered to donate $1 to fund research into new treatments and cures for diseases like cancer, Alzheimer's and Parkinson's, up to $5,000. So far, about 2,700 Mayo history buffs have taken the exam. (No information on how many aced it — besides us). You can join their ranks and help make it rain by taking the quiz yourself. And perhaps challenge co-workers, family or friends to see who's the better student of Mayo history. Who knows, you might learn something in the process, and you could be part of the next big breakthrough. The Mayo Mystery History Quiz will be up through for the remainder of the Sesquicentennial year. You can brush up on your Mayo Clinic history by visiting the Sesquicentennial Website and reviewing its list of Mayo Clinic’s 150 Contributions to Medicine. Then tell us how you did on the quiz by posting a comment below. And share this story with others, while you're here.